Sometimes Krishna sends His representatives—as saints, prophets, or His sons—to teach humankind about Him, and sometimes He comes Himself, as He did approximately 3000 B.C. He spoke the spiritual and philosophical teachings known as the Bhagavad-gita, which explains the essence of our spiritual identity and our relationship with God. Krishna's Book—The Bhagavad-gita—Krishna's helpful hints for humans: The original guidelines for achieving the goal of life. 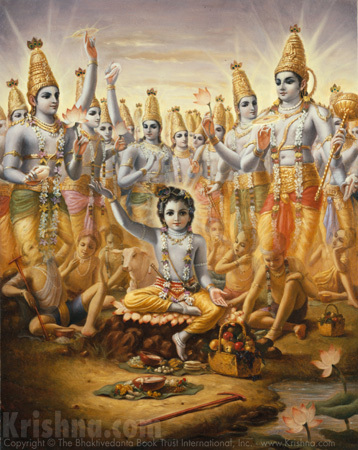 About Krishna's many incarnations—throughout the millennia, the Lord appears many times, in many forms. Here we spotlight some of Krishna's more well-known avataras (incarnations). Krishna's latest incarnation—Chaitanya Mahaprabhu—The most recent (c. 1486) avatar of Krishna, and the greatest teacher and example of Krishna consciousness. Lust isn’t love, so it doesn’t last. But the love between the gopis and Krishna never breaks. That is the difference between lust and love.